I had an idea for a map of Westeros in a steampunk AU of the A Song of Ice and Fire universe a while back, and decided to go ahead and do it because I am dumb and have lots of time on my hands. Anyway, the AU is not quite as straightforward as I'd like it to be, so here's an explanation. Long ago, the Valyrian Freehold did not find dragons within the volcanoes that stretched across their peninsula. Instead, one man found an old woman who gave him a gift of knowledge: the knowledge to create machines. Using this knowledge, the small Valyrian tribes formed the Valyrian Freehold based around new technologies such as gunpowder and steam, with weapons that fit. They soon conquered the Ghiscari Empire, who still relied on swords and shields. Their victories were swift, and soon almost all of the continent of Essos was under their sway. However, the Valyrians kept most of their technology a secret, letting little of it ever leave Valyria went not at war, and so much of the world remained medieval in technological level. Valyrian technology advanced, first from steam to petroleum-powered machines, and then even to the unlocking of the secrets of the atom. However, something went wrong, and the whole Valyrian Freehold was bathed in nuclear fire that eradicated all life from the area for centuries to come. The rest of the world broke free, and managed to steal some of the technology from the dying Valyrian empire. What we know as the Free Cities banded together to form the Holy Valyrian Empire under the God of Light, R'hllor. They are one of the most technologically-advanced empires in the world, but are still in danger from the Dothraki hordes of steam-powered airships that prowl the skies and the recent events in Slaver's Bay, where news of a mysterious figure uniting the slaver cities together has reached the Holy Valyrian Empire capital of Pentos. Across the Narrow Sea, Westeros was conquered by House Targaryen using airships that rained down fire upon the Westerosi armies, most of whom were armed with medieval weapons or crude guns. From there, House Targaryen from their new capital of King's Landing rapidly advanced Westeros' technology, turning the agrarian kingdoms to industry and mass commerce. History went the same as it always did otherwise, but with many changes from pre-Targaryen days. The Vale of Arryn, ruled by House Arryn, went from an isolated and quiet kingdom to a booming center of industrial might as the massive mountains of the Vale were filled with coal, iron, and other raw goods. The Vale is now covered in railroad tracks, the only exception being the route to The Eyrie, which is still only by goat path. The Reach and the Riverlands remain prosperous from agricultural goods to feed the booming population of Westeros, most of their goods carried by steamboat on their rivers while Oldtown is the most prosperous site of learning in Westeros and Harroway the entire continent's crossroads. 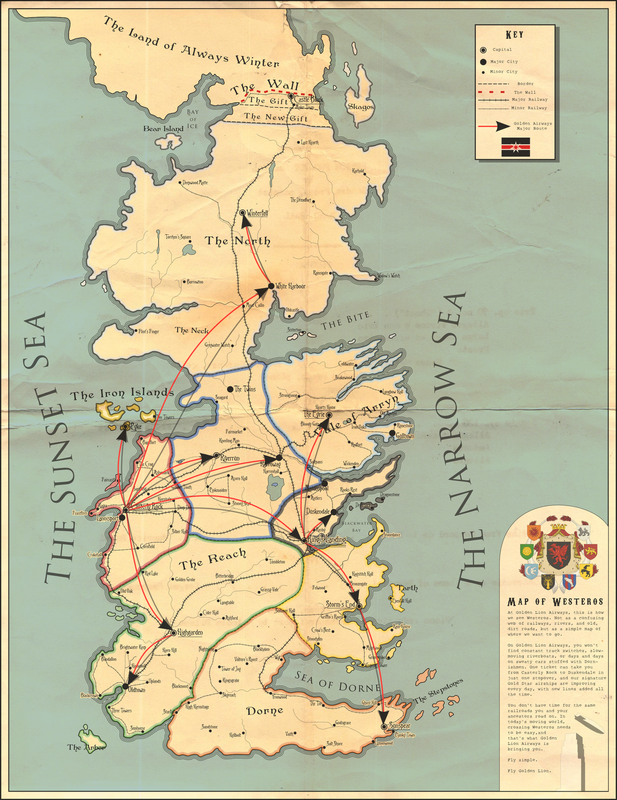 The kingdoms of the North and Dorne, however, become even more isolated as their small and thinly-spread populations adapt poorly to the new industries and are regarded as backwaters by the other kingdoms, with the North and Dorne having very few railways of their own, relying on the Targaryen-built and Targaryen-run inter-kingdom railways. Only White Harbor can make any claim to be a modern city, though Winterfell and Sunspear are on their way. It was the Westerlands, however, that were hit hardest by industrialization. Gold became far less needed than ever before, and the transition broke the back of House Lannister for decades, allowing the House Reyne to, for a time, have de facto control over the Westerlands. House Lannister eventually bounced back via a change to banking and business ventures, that used all that remained of House Lannister's fortunes to change Casterly Rock and Lannisport to be hives of new business and Westeros' largest banking firms. Once again, House Lannister became powerful. They grew their power even during Robert's Rebellion in 282 AC (After Conquest), which saw Rhaegar Targaryen smash Robert's forces on the Trident when his personal aerial forces, the Dragon's Breath Airships, destroy Robert's land-based army and Rhaegar himself kill Robert Baratheon with a pistol shot. House Lannister refused to intervene, other than cut all ties to House Baratheon. Rhaegar forgave Ser Jaime for killing his father, as he needed to be king anyway, and instead banished him from the Kingsguard and back to Casterly Rock, much to the delight of Cersei. He became Cersei's personal knight as she was sent to marry Loras Tyrell and he to marry Margaery Tyrell, to give House Lannister a strong link to The Reach, which Tywin Lannister felt was needed in case of further conflict. The year is now 300AC. Winter is coming, but the wall's cannons can hopefully stop the Others, but it is unknown whether they will be enough. In the south, House Targaryen remains the most powerful, along with House Arryn, but House Lannister is rising ever higher. In particular, House Lannister recently expanded Golden Lion Airways, their signature airship line. As House Targaryen controls all inter-kingdom travel by rail and river, placing taxes on them to feed the royal treasury. However, no law says anything about inter-kingdom travel by air, and so House Lannister has quickly begun to corner the market on airship trade via Golden Lion Airways, expanding their routes all across Westeros. Here, you can see one of their common advertisements, showing the advantages of airships over rail travel. This is a very interesting take on things, and I like that in this verse a Valyrian Empire still exists in Essos, even if it's basically sort of sounds equivalent to the HRE.